Right after engagement season (the period from Thanksgiving to New Year's) it's bridal show season. During the last nine months of my engagement I have not attended a single bridal show. Now suggestions for bridal show events are showing up all over my Facebook page. As a 2017 bride with most of her vendors already chosen, I wasn't inclined to check out any bridal shows during the next few months, but I was offered the opportunity to be the featured bride at my photographer's booth at the Today's Bride Bridal Show in Cleveland, which gave me the opportunity to interact with other Northeast Ohio couples, as well as explore the displays at the IX Center. This is a two day event, I was present just for the second day of the bridal show. The super cute stemless wine glass above was available for purchase with champagne, wine, or a cocktail. As you already know I'm obsessed with all things Ohio, so I needed one of the glasses. Once I was done at my photographer's booth, I was free to explore everything that was going on at Today's Bride Bridal Show. I love the idea of ordering some chic furniture if you have an empty space to decorate or want to add some pizzazz to your cocktail hour location. This set-up is from All Occasions Party Rentals. Aside from bakeries having samples available, they also showed off the end product. There was a section of just decorated wedding cakes that brides could get a visual taste of what each bakery could offer after they sampled some cake. This cake is from Reeve's Cake Shop. This cannoli cake is from Rito's Italian bakery. This cake was my personal favorite, but I'm almost always a fan of the more non-traditional option. Kathy's Cakery made and decorated this stunning cake. The Faithful Little Cupcake based out of Wooster, OH created this stunner -- the pictures doesn't even do this cake justice it was really as tall as I am. 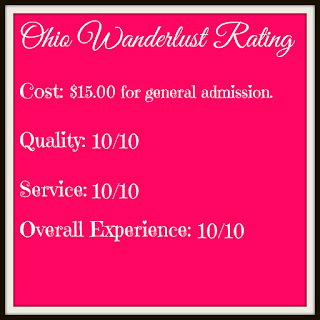 Per their website, although they are located in Wooster, The Faithful Little Cupcake will deliver all over Ohio and Southeast Michigan. For couples looking for a less traditional option Peace, Love, and Little Donuts of Hartville was present with wedding pricing and displays. Lavender Bridal was present with a large selection of gowns, brides were able to try on samples and purchase gowns. Sensational Cakes ... and More! had this delicious Pina Colada Cake with Caramel Buttercream and Toasted Coconut. If your sweet tooth wasn't quite satisfied, there was a gorgeous candy table display set-up by All City Candy. They also had some favor ideas available at their booth as well. Crystal Bloom had some gorgeous and unique centerpiece ideas for couples looking for something other than flowers. 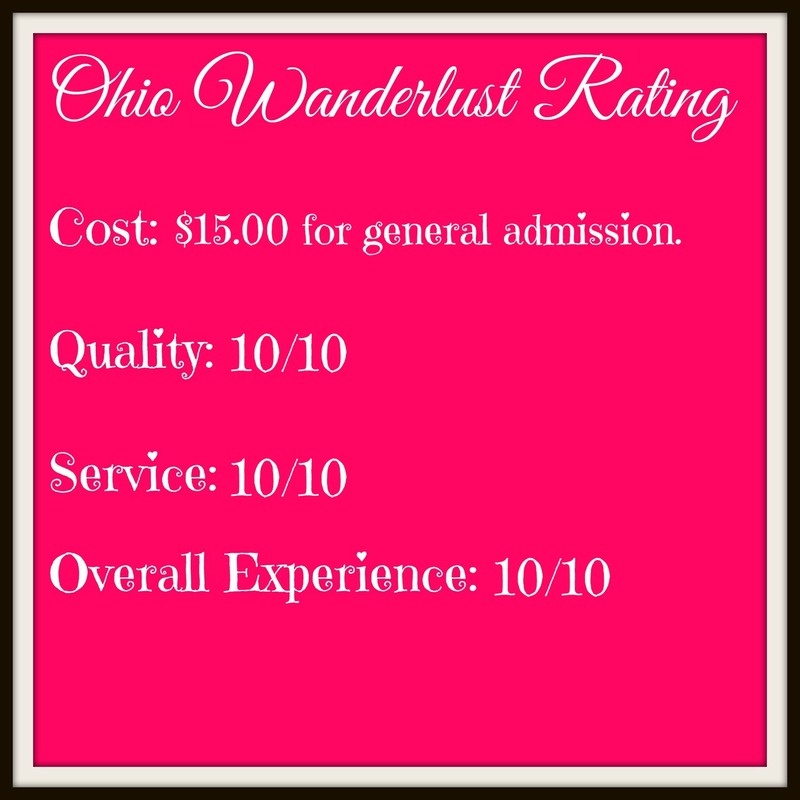 Let's Get Festive is a Cleveland event planning company offering customized invitations, decorations, and open air photo booths. I really loved this unique guest book that Let's Get Festive had on display. Just like with the cakes, vendors were able to turn their table designs into art for the attendees to view. By Copper Stone Catering and Event Center. By L'Nique Specialty Linen and Rental Company. By Farah & Nour Flowers and More. Champagne Angel, also available for hire via Party Decor. Another unique solution to avoiding live flowers is these flowers from Upcycle Parts Shop. All of these flowers are made from recycled plastic bottles and they look so cool. The bottle blossoms are available for purchase individually or in gorgeous arrangements -- they're also available for rent. There were many photographers there and all had beautiful booths displaying their work, but I was at Today's Bride Bridal show, because I attended with my photographer the owner of Jadie Foto, LLC. 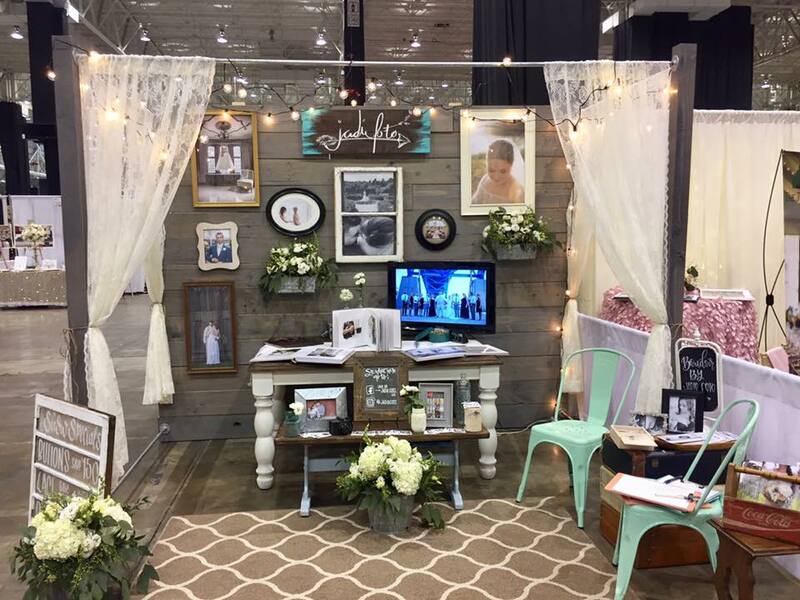 Here's her super cute booth, I'm thrilled to be one of her 2017 brides! This post is not meant to be an all encompassing look at the event that was held today in Cleveland, it would take days to write about every single booth and to comb through all of the photos. If you'd like to see a full list of vendors, take a look at the list here. The IX Center was packed with vendors, brides, grooms, and family members. With all of the vendors present, and the fact that Today's Bride also holds an Akron-area bridal show, I hope that people were able to get plenty of inspiration. 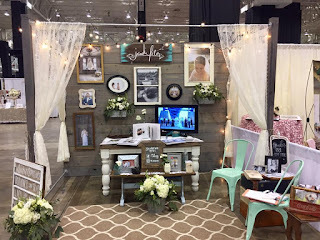 **Although I did receive complimentary admission as the guest bride in Jadie Foto's booth, I was in no way, monetarily or otherwise, compensated for this post by Jadie Foto, Today's Bride, or any vendor listed above. All opinions written above are entirely my own, this post contains no affiliate links, and I am not receiving any monetary gain from this review. Super amazing Bride Wedding Show. It looks like so fun and amazing. I had wonderful time. I am also going to get married at some local Seattle Wedding venues and would like to attend such shows to attend such events for getting some nice ideas for my DIY wedding décor.